Powertrain swaps are not that unusual in the Jeep world, but are typically done with domestic engines like the Buick V6 or a small block Chevrolet V8. Volvo engines are also no stranger to engine swaps – though not quite as common, the Facel Vega Facellia received the Volvo 4-cylinder both as a retrofit to make up for the shortcomings of the Pont a Mousson four-cylinder, and then as factory spec. 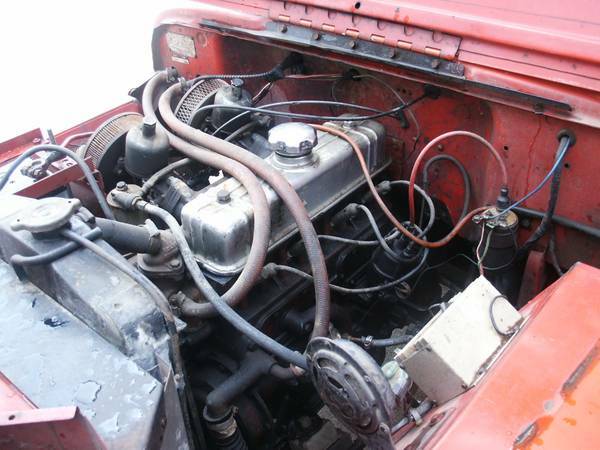 But a Volvo 4-cylinder engine into a Jeep? That’s something new. 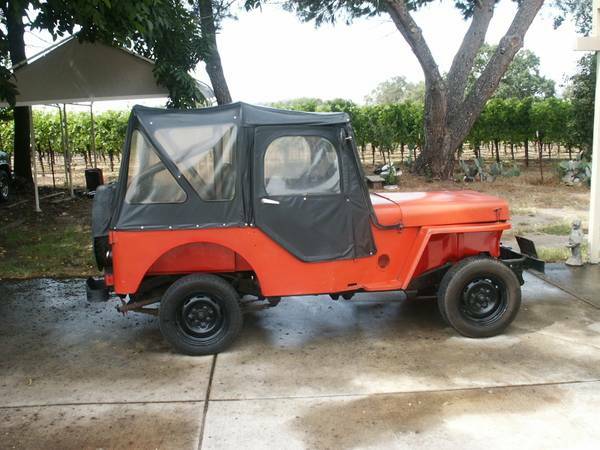 Check out this 1964 Jeep DJ3 with a Volvo engine for sale for $3500 in Santa Rosa, CA. Not only is the powertrain swap oddball in nature, the Jeep is a bit of an oddball too. The DJ3 was conceived as a model for customers who didn’t need four-wheel-drive capability, but did want horrible insulation from the elements, poor handling, and 60hp L-head engine. That group ended up including various delivery services including the post office, as well as hotels and fair-weather car-rental companies. It’s impressive to see this one still wearing its canvas top and doors with decent looking windows. It’s also surprising how straight the body is – the paint does appear to have some fading, but it’s a decades-old coat of red, so you wouldn’t really be surprised. For some reason one of the owners fitted these small Datsun wheels – perhaps for better handling or tire availability? Usually small tires are better in the world of old cars, but in this case, you’ll want to find something a little bigger so it doesn’t look like it’s riding on emergency spares. Here’s this Jeep’s party trick – a Volvo 4-cylinder of unspecified displacement or origin, fueled by twin SU carburetors, and powering the rear axle via a Volvo 4-speed transmission. Of the seller’s 35 year run with the truck, it’s been stored the last 25, yet is said to run well, and is also equipped with a rollbar, and best of all, comfy Volvo seats. It’s a pleasure to see one of these without the usual tasteless modifications, and wearing a set of California black and yellow license plates to boot. 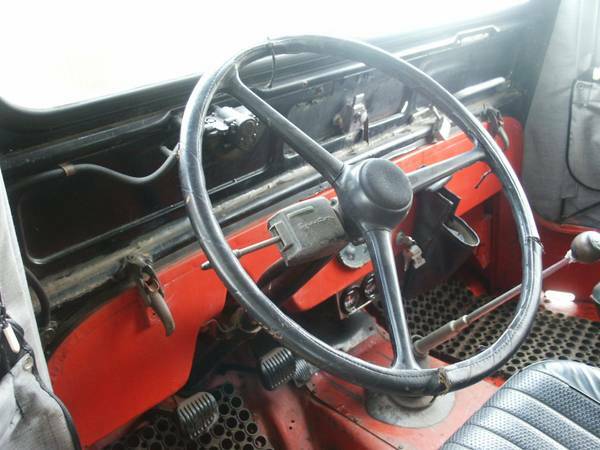 The interior actually looks pretty decent, for what it is, and while it retains the original steering wheel, it’s wrapped in leather so you don’t forget the dual SUs that are always ready to go. The seller does not say if the gauges are functional, but does include that the car was used to deliver pizzas in San Francisco. What would you do with this alt-powered icon? How about lowering it, fitting a set of minilites, and going to vintage sporty car events? This entry was posted on June 11, 2015 at 9:27 pm and is filed under Feature. You can follow any responses to this entry through the RSS 2.0 feed. You can leave a response, or trackback from your own site. 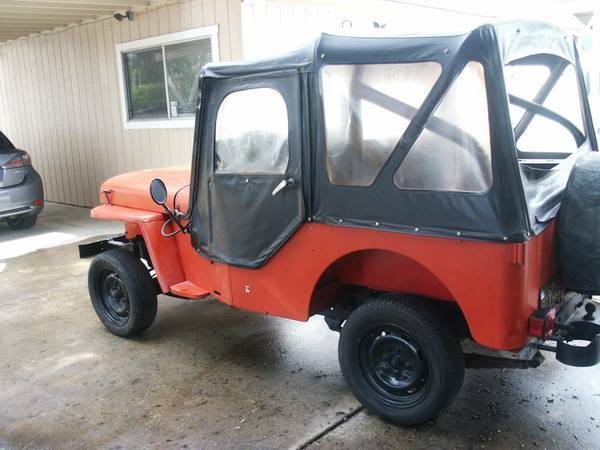 An interesting look at a very unique old Jeep! It kind of looks like a roller skate with the tiny wheels. I did have a Suzuki Samurai 2wd some years ago which would be this things “late 80’s beat you to death for no good reason” equivalent.